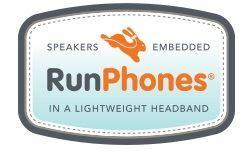 RunPhones is a trademark of AcousticSheep LLC and developed by Dr. Wei-Shin (GP) and her husband Jason Wolfe (video game developer). From her own experience having difficulties getting asleep, dr. Wei-Shin developed the headphone in comfortable headband. By enthusiastic reactions of some of her patients who could sleep better with the SleepPhones, they developed the products sound quality and different fabrics and is now a successful patented product. Since the SleepPhones were used also in other activities, the product has been developed to RunPhones, a comfortable headphone to wear during different sports or any other activity.